Ever since ancient times man has been required to traverse the bleak mountainous regions of the North of England to barter or sell his wares, his animals; cattle, oxen, sheep and goats. Man has also moved his cattle on to better pastures, for the well-being of himself and his family depended on the milk, meat, hides and bones. Therefore, to enable him to live more profitably, man constructed bridges across the numerous fast flowing mountain streams and becks. Many of the pathways over the mountains and hills of Northern England had been trod by ancient Britons and also Roman soldiers. All over the North of England where the Jaggermen’s trails came down from the tops of the hills to the many rivers and becks, these water courses would be crossed by old wooden bridges or by ancient fords. However, where the banks were too steep, then a steeply humped, single-arched bridge would be constructed. Many of these specifically designed bridges were built particularly in the seventeenth and eighteenth centuries, the accentuated curvature of the arches allowing high levels of flood water to flow beneath. The majority of these packhorse bridges when first built either had no parapets or had extremely low ones to allow the heavily ladened Jaggermen’s packhorse trains to pass over without hindrance. 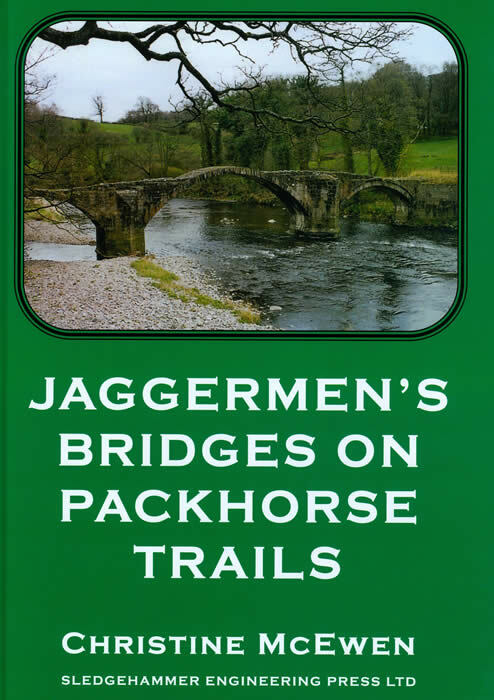 The majority of the surviving packhorse bridges of Northern England are to be found in the wilds of Cumbria, North Yorkshire, particularly in the Dales, and the South Pennine regions of West Yorkshire and East Lancashire.